The problem with mentioning anything about a black woman as a white man is that NO MATTER WHAT you are going to be scolded by the entire apologetic leftist media for having done nothing. The comment O’Riley made was NOTHING like the comment that got Don Imus kicked off air years ago. This was a comparison between two haircuts. The joke was in great taste considering Waters incessant and ignorant assault on the right, not to mention her god awful track record and her inability to sound like someone you should listen to. Apparently, it takes nothing but a James Brown wig to be a Representative from California these days. The left believes that any comparison or criticism of minorities is automatically a sign of deplorable racism, and they have been using this tired technique for years. How many times have they called Donald Trump “orange” or made jokes about his hair? The left even applauded a grotesque naked statue of Donald Trump erected in New York; when a similar statue of Hillary Clinton went up, they tore it down, with chants of ‘sexism.’ They can dish it, but lord knows they can’t take it. Oh! But Maxine was not to be silenced! The old loon (and when I say ‘loon’, I really do mean it, she’s in her own world right alongside Louise Mensch . . .) decided to get on Twitter and pander to the #BlackWomenAtWork hashtag with a cute little tweet . . . Apparently, every “strong black woman” needs to affirm their strength through social media validation since being strong is no fun when you don’t have anyone to call a “racist”. April Ryan, a woman who has built her career on race-baiting and being a “victim” rather than on good journalism, also kicked up some dust this week in an attempt to cry “racism”. The White House correspondent for American Urban Radio Networks is known for not reporting the facts and for being little more than a race-baiter and in the world of feminist fury, turned on the woe-is-me-I’m-a-woman angle as another to add to her I’m-a-victim arsenal of defense. While asking the same tired questions of the Trump Administration and “Russian interference” that has been lock step with the liberal narrative since DAY ONE, Ryan didn’t even bother to hear Spicer answer her question. She shook her head when she was scolded by Sean Spicer for not reporting the facts and then she shook her head when she got the answer she did not want. Is Spicer being attacked by the left, just like so many others these days, based on the color of his skin and the fact that he’s a male? April Ryan obviously didn’t care about what he had to say or the answers she was being given, rather she chose to dismiss the entire thing with condensation – yet Spicer is the one who is racist? For asking her not to condescend to the White House Press Secretary? How does that make any sense? AND THEN Hillary Clinton, still clueless to the American voter, and average American, gave a speech calling both the Waters and Ryan “incidents”. Hillary claimed that it was Ryan who was patronized – while she was shaking her head at Spicer. Hillary claimed that comparing any black haircut to another haircut is “racist.” Hillary then says this is just another example of how “too many women of color [are forced to take] indignity in stride!” What reality are we living in? 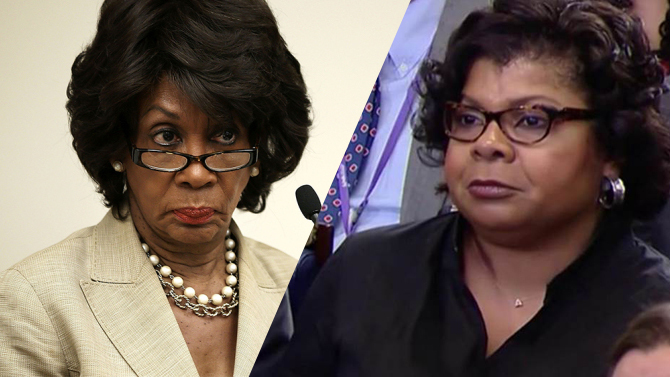 Ryan and Waters are prime examples of race-baiters and people who have realized that the merit of their work is so unsubstantial that they had to go and attack one man for a passive comment about rude body language (April Ryan) and the other for a simple comparison. Being a black woman doesn’t mean you can throw temper tantrums and get whatever you want whenever “the powers that be” come at you tough, or with a joke. These are the techniques – false accusations of racism/sexism/homophobia/etc – the left has been using since the 1970s, they are no longer effective. Let’s see how long it takes them to realize that.